Welcome to the 2018 Cheerleading Season! Updated Monday May 7, 2018 by Ken Alberti. Welcome to the 2018 Cheerleading season!!! Games are played on Sundays at the Guilford High School. We arrive at the Field one hour before start of game to warm-up, position for half-time routine, and practice some cheers. Parents are responsible for transportation and/or car pooling arrangements to and from all games. Since there is no specified time for the end of the game, be there EARLY. We practice and play in the rain and possibly snow….DRESS APPRORIATELY. Parents are also encouraged to visit our web site at www.guilfordyouthfootball.net as well as, downloading the TeamWall App. for practice, game schedule, and other information. Attire for Games: Always ~ vests, skirt, no see socks, white sneakers, spankie and poms. No jewelry of any kind. Hair needs to be pulled back into a high pony tail with ribbon worn. Mandatory: Water bottles must be brought to all games. GATE DUTIES: Please look for Team Mom’s email regarding gate time sign-ups. It is the responsibility of Cheer families to collect gate fees and offer 50/50 raffle tickets during games. Please take your turn and support our Youth Program. The money collected goes to fund the Ambulance service at all home games. We will be participating in the Guilford Citizens Parade. We will meet on the Green across from Page Hardware around 9:30 and walk as a squad to our spot in line. Please collect your child at the end of the parade route near the Old Griswold house at Lover’s Lane. Arrive at Guilford High School at assigned time. We will walk over as a squad for group and individual pictures. Appearance: Uniforms must be kept neat and clean, great smiles. Please do not chew gum and no cell phones are allowed on the field. Attitude: Cheerleaders will always display good sportsmanship. Cheerleaders will always respect an injured player. 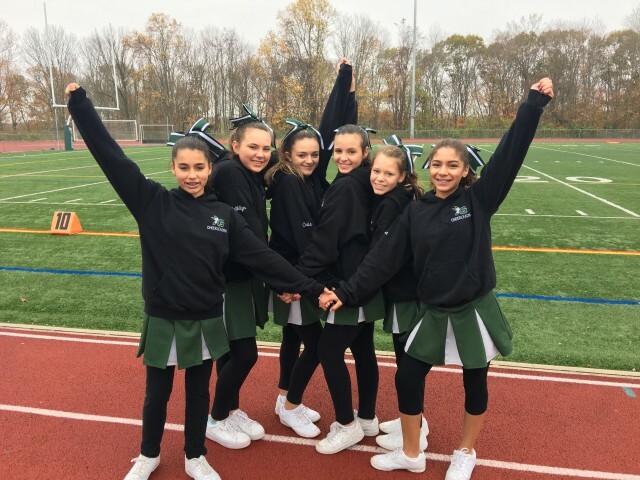 Cheerleaders will always listen and cooperate with their coaches and game officials. Cheerleaders will be confident, optimistic and cheerful. Cheerleaders are always polite and respectful to each other and Cheerleaders from other towns. It is recommended that ALL Cheerleaders and their families support Guilford Youth Football and Cheerleading. It is necessary for us to support our team with raffles, gate duties and any other fundraisers. We are the Indians and we are the BEST! !